Contributed by Bill Corvo of Middletown. 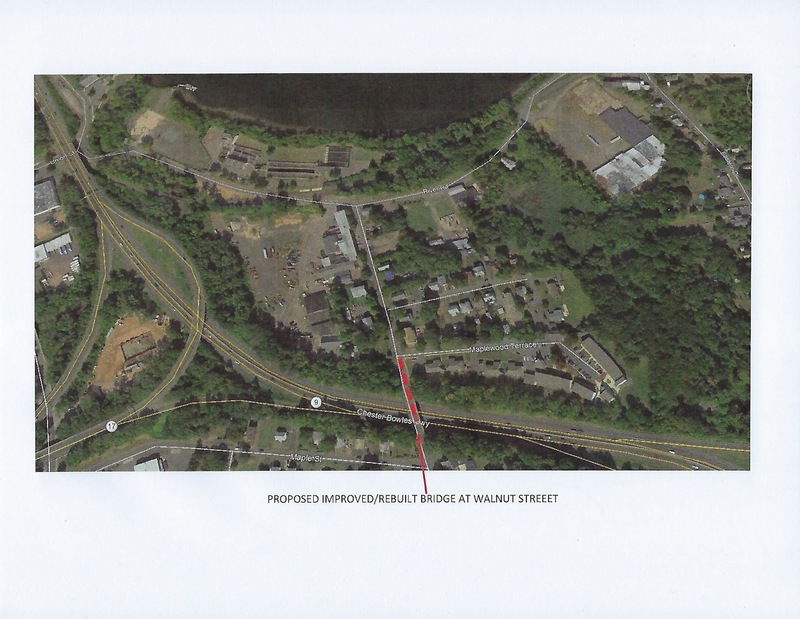 I have continued my review of the DOT’s proposed modifications to Route 9 in downtown Middletown following a conversation with Stephen Hall, Project Engineer with the Bureau of Engineering and Construction. It is obvious that there are a number of important problems that must be addressed as a result of changes in traffic flow and volume to and from lower Middlesex County. Safety issues are of paramount importance as well. In my previous comments I indicated major problems which I identified with the proposed Route 9 North exit into Middletown at Rapallo Avenue. After looking over the design modifications for Route 9 South I have come to the conclusion that the proposed changes will achieve the impact of improving traffic flow and improve safety. 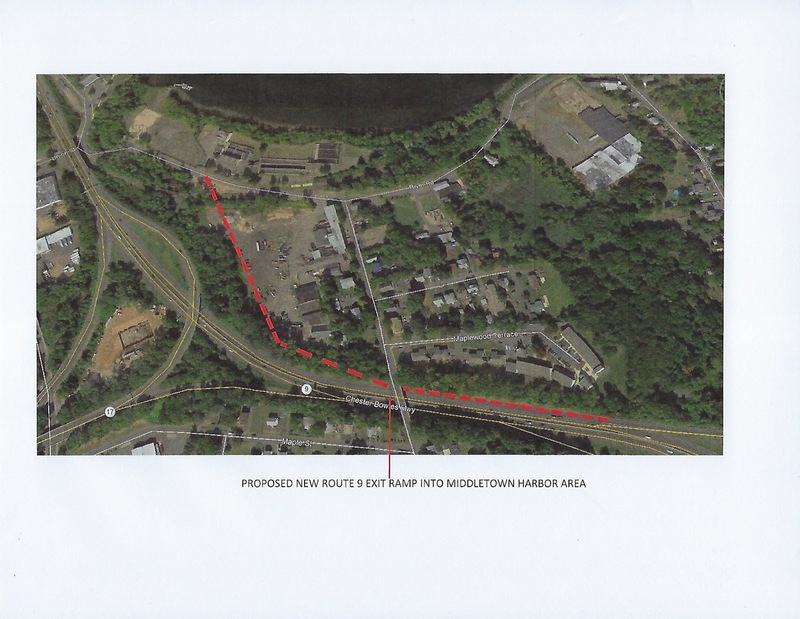 Based on documents provided to the public by the DOT the Rapallo Avenue exit from Route 9 North does not result in improvements of traffic flow in Middletown and raises a variety of safety issues. I believe it is also the most expensive part of the proposed development. The “fly-over” from Route 9 North over Route 9 South and the railroad line running parallel to Route 9 and the railroad line running east to west parallel with Rapallo Avenue also present issues with construction and aesthetics. The need for some type of modification is not an issue-however the methodology currently proposed for the Route 9 North exit as proposed will not be an improvement. The existing Route 9 was a major improvement over what it replaced i.e. River Road heading north towards Cromwell and Saybrook Road heading south towards lower Middlesex County. It has remained as an improvement for more than fifty years. The modifications required to eliminate the current problems should also be able to be of benefit for at least fifty years. This is not the type of project that is going to be fine tuned down the road after spending in excess of $70 million dollars today. Accordingly, I have taken another look at the possible alternatives to the Rapallo Avenue approach. I have already indicated that the best way to resolve the issues without creating massive congestion in the North End with all of its negative impacts would be to have the Route 9 North exit shifted south in the area of Harbor Park. One of the apparent problems with having the exit shifted to the Harbor Park area is the proximity of the entrance ramp to Route 9 from the Eastern Drive area merging into Route 9 North just prior to the curve in the highway which would provide the off ramp to the harbor area. When originally built the Eastern Drive on-ramp served the Connecticut Valley Hospital campus. At that time the population and staff at CVH was substantial, in the neighborhood of approximately 5,000 people. River Road was also used as an alternate conduit for traffic from Pratt and Whitney’s campus into Middletown and Route 9. The CVH population/staff is greatly reduced since that time period and Pratt and Whitney has closed the gate and shut off access to River Road from its campus. I believe the positive resolution to the Route 9 North exit into Middletown calls for modifications which will achieve the most beneficial result at the least cost. 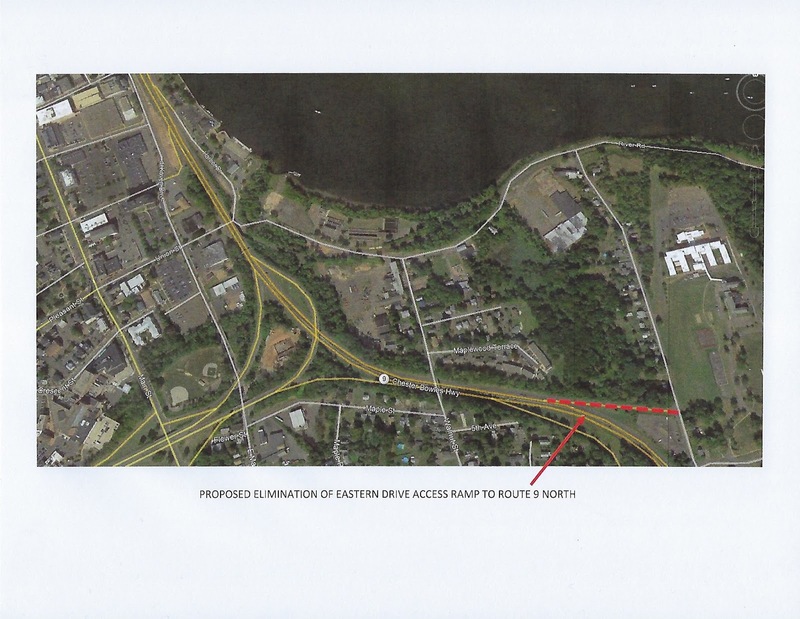 I suggest that DOT examine the closing of the Eastern Drive access onto Route 9 North as part of this solution. Route 9 North access would still be available at Randolph Road.2 By closing the Eastern Drive access one problem would be eliminated and Route 9 heading north from that point could be widened to help accommodate a better approach for a new exit into the harbor area. The bridge at Walnut Street, which is fairly old would also have to be improved/replaced in order to improve the new access into the harbor area. 2 Approximately 2.5 miles to the south. Alternate access from CVH would be Silver Street to Main Street Extension with access to Route 9 North from that point as well. 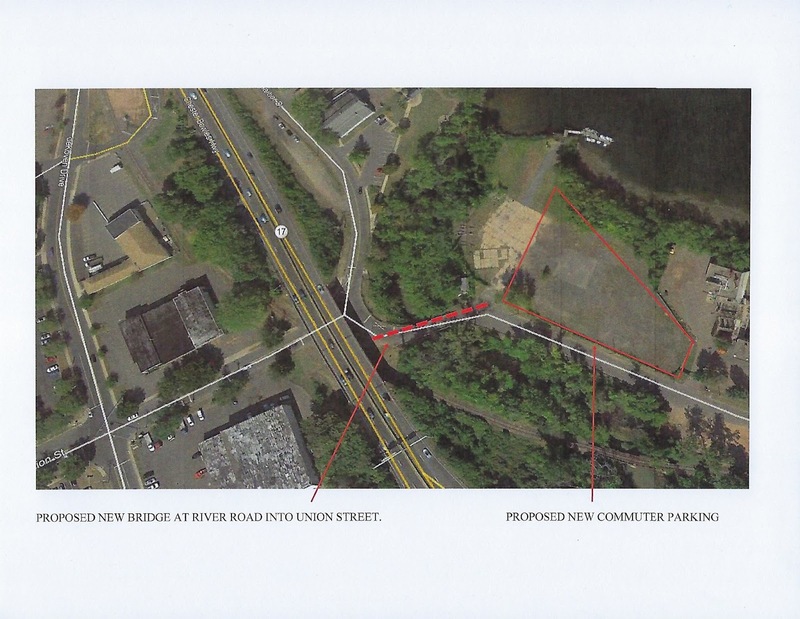 As part of the improvements required in the harbor area I would also suggest that the old and currently inadequate bridge at River Road which feeds into Union Street will need to be improved/replaced. Additionally, I would recommend that a portion of the property currently being used by the Water Pollution Control Authority for its treatment plant be converted into a commuter parking lot. The commuter parking lot would also be a major benefit for the harbor area and would be available for use by the general public using other facilities in the harbor. The net result would be that commuters would be able to access a variety of roads and streets to arrive at destinations to the north- including the Arrigoni Bridge. Northern access would be available from Union Street into DeKoven Drive as well as Main Street. Access to points west would be able to utilize Union Street and head towards Main Street or Pleasant Street to be able to move towards Durham, Middlefield and Meriden. There would be no negative impact on residences by using the harbor exit system and costs should be reduced by avoiding the need for an expensive “fly-over” construction system. This design would also eliminate the need for a “left lane” exit- another safety benefit. The exit at the Middletown Harbor area would also provide a parking facility and improved access with a new bridge into the harbor area. This would help Middletown in a long-term goal to improve and develop the Harbor area of the community. I believe that it is important to take the time necessary to get the new proposed design “right” so that it does no harm to Middletown and its citizens while at the same time improves the safety and functionality of this important highway system. Once modified we will have to live with it -good or bad- long into the future.